Major newspapers publish dry factual lists of statistics on their front pages indicating cohabiting without the benefit of legally sanctioned marriage is on the rise. Paradoxically, the same issue might contain a whole section printed on enticingly glossy newsprint that’s expressively and engagingly devoted to highlighting fashion choices extolling the virtues and longevity of vintage designs and the lasting appeal of one-of-a-kind dresses for the quirky, adventurous bride-to-be. Although many couples in committed relationships are forgoing the sanctity of marriage, the wedding industry appears to be thriving. And on the wedding day, appearances are everything. It’s the memories that count. It’s been estimated a staggering 75 per cent of brides choose a strapless gown for their big day and that leaves a lot of bare flesh crying out for something shiny and fabulous. All eyes are on her; all the other details—the bouquet, the menu, and the venue—are important to the couple, but let’s face it, the poor hapless groom often gets lost in the shadow of the meringue dress. It’s the extra measure of decorative baubles for adornment that embellish the beauty of each individual bride bedecked in her choice of jewels, and such ornamentation serves to enhance rather than distract from the embroidery, lace, chiffon, netting, and glittering Swarovski crystals sewn onto the gown in swathes of ethereal charms. With their slightly different lengths, negligee-style pieces are designed to hang elegantly and the attractively balanced pendants are usually spaced equidistant to bring attention to the cleavage area. It’s used very effectively in a necklace format highlighting the oft-admired clavicle region of the bodice. Predominantly, they’re set with diamonds, but also with an occasional pearl accent for a distinctive ‘toi-et-moi’ effect. 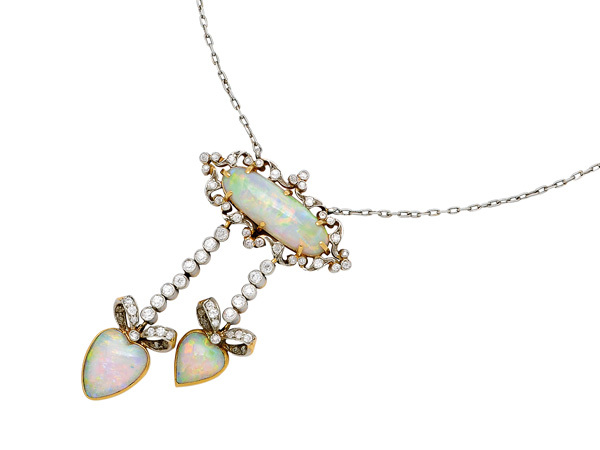 One delightful Belle Époque example is a rare pendant necklace designed by Tiffany & Co., set with oval and romantic heart-shape crystal opals. The gems exhibit a strong play of colour in a full spectral range and even distribution. The motif has been popular in all its incarnations, flowing across various jewellery periods. A modern refinement of the look comes from Van Cleef & Arpels’ ‘Magic Alhambra’ collection decorated with pavé-set diamond quatrefoils, while Tiffany & Co., has created a simpler lariat rope form. Dangly earrings dripping with multiple-drop girandole or chandelier plaques, and pendeloque styles with their elongated pear-shape stones would be shown to best advantage if the bride’s hair was set in an up-do. 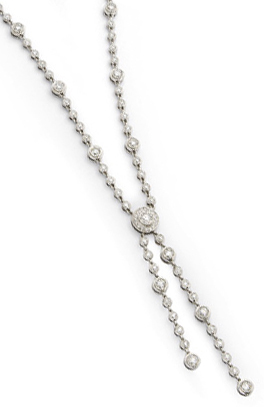 The classic rivière necklace of slightly tapering diamonds leaves a lasting impression. For a little more drama, there are fringe-type and choker necklaces to accent the collarbone. 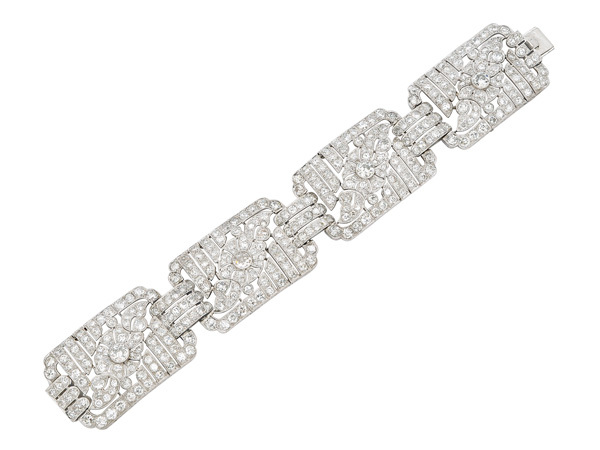 Wide strap bracelets made of platinum are often composed of multiple pierced plaques. Typically, odeonesque arch motifs indicate retro origins and the French houses of Mauboussin and Cartier were notable for their particularly fine examples. Broad, articulated bands from the art deco period often depict floral and foliate panels between bar connectors. Culture, budget, taste, and sometimes chronological age, all contribute to the harmony of the main event. No two weddings are alike. Whether the theme is sweet or bold, relaxed and casual, or has the most haute esthetic, gems for the bride are just as infinite in variety as the women wearing them, to paraphrase Mr. Shakespeare.